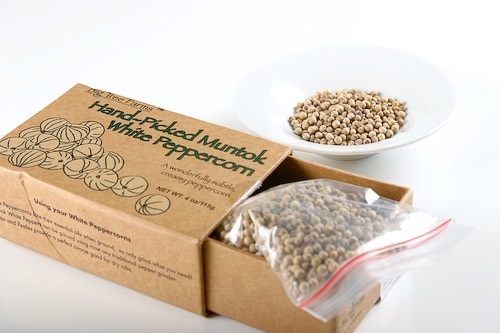 One of the BigTree Farms products I picked up in Bali was a box of Muntok White Peppercorns. White and black peppercorns are the same thing. The black peppercorns are unripened berries that are cooked briefly and then allowed to dry. 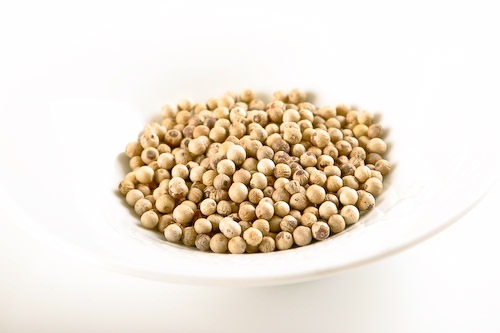 The white peppercorns come from fully ripe berries that are soaked in water for a week. The soaking allows the fruit surrounding the seed to fall off. White pepper has a different flavor than the black variety. Of course describing that difference is tough. Luckily Harold McGee has a great overview on what contributes to the white peppercorn’s flavor. In the hills behind the village of Muntok, on the Indonesian island of Bangka, pepper farmers climb traditional bamboo tripods and hand-pick fruit spikes of red ripe pepper berries. The fruit spikes are packed into rice sacks and soaked in slow running streams of water that come down off the mountains above. Seven days later the outermost skin of the pepper has disintegrated and the peppercorns are piled together for a traditional trampling called â€œnari merecaâ€ or the Pepper Dance. The dancing separates the peppercorns from the fruit spike and after a final washing the berries are left to dry in the sun where they will bleach to a whitish-cream. This assumes that seeing black, red, or green pepper is visually unappealing. Beauty, after all, is in the eye of the beholder and I like seeing pepper, regardless of frumpy French standards. Most of us Italians have been using white pepper for many generations, so it’s not a big deal to me. I mean, I would never season my famous pasta dishes with a black pepper because as most of us cooking-school graduates (I graduated from Peter Kump Culinary Institute in Brooklyn, NY) were taught — visual appeal is as important as taste appeal.